The International Society for Trenchless Technology (ISTT) No –Dig award for Project of the Year has gone to UKDN Waterflow, for a unique strengthening project which saw Crossrail Tunnel Boring Machines passing within 500mm of the Ham sewer, a major arterial pipe serving East London. The ISTT was established to advance the science and practice of trenchless technology with regional trenchless societies located throughout the world to advance these objectives globally. ISTT has 27 Affiliated Societies. Awards are made each year in order to recognise the achievements of corporate or individual members, as judged by their peer group. The complex 20-day Ham sewer project (with associated works spread over a number of months) saw a 50 metre continuous duplex stainless steel structural design lining jacked into place within the Ham sewer and precision welded to standards normally associated with very high pressure pipelines. UKDN Waterflow worked with the Dragados Sisk Joint Venture (DSJV) and Thames Water on behalf of Crossrail on this project, with engineers Fairhurst providing consultancy support. During works the sewer was diverted using six 300mm pumps accommodating a peak sewer flow of 800 litres a second to the nearby Wick sewer. A new weir and penstock valve blocked the flow, and three generators producing a massive 1.2 megawatts of power kept the pumping going around the clock. Each of the five tonne sections was jacked into place along guide rails before being meticulously welded together to standard EN1011 and tested using ultra sonic NDT to EN5817 category C to ensure a 100% pass rate. Crossrail’s two 7.1 metre diameter Tunnel Boring Machines (TBMs) passed just 500mm from the sewer, in what is believed to be the closest pass by a large diameter TBM to a major sewer for this type of work. 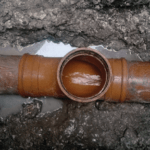 Since 1986 entries have been invited for the annual No-Dig Award for the most notable advance or achievement in Trenchless Technology, as judged by the ISTT Technical Panel. Selection of ISTT award winners is based on a strict criteria that includes the project’s contribution to the advancement of trenchless technology world-wide, the innovation involved, the environmental benefit, and how well the project has been presented. The ISTT No-Dig award for UKDN Waterflow will be made at 32nd International No-Dig in Madrid, Spain, in mid-October. This takes the number of awards UKDN Waterflow has won for this project this year to two, with the prestigious NCE International Tunnelling and Underground space award, of which UKDN Waterflow is a finalist in the Renovation category, to be decided at the end of the year.